*Qualifying Free or Flat rate orders ship via the least expensive method chosen by rate shopping software at time of shipment. 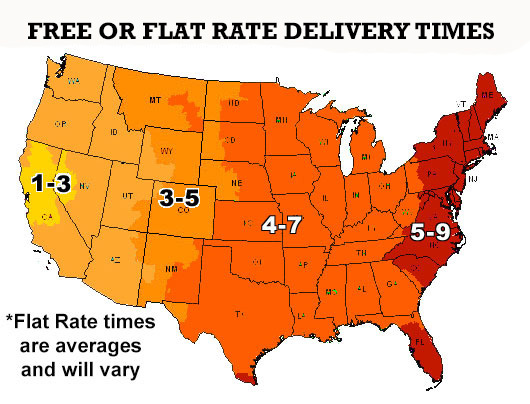 Flat Rate Delivery times are not guaranteed. Orders shipping outside the lower 48 states and or orders containing heavy Actual Shipping Items such as sacks of grain, glass bottles, and carboys do not qualify for Flat Rate Shipping. Need something on a certain date? We also offer Fedex Home Delivery, Fedex Three Day, Two Day, Next Day Air, and Priority First Class calculated for you at checkout. Choose from a wide variety of optional faster shipping methods based on your needs and budget. Fedex Air delivers Monday through Friday, Fedex Home Delivery delivers Tuesday through Saturday, and Priority First Class Mail delivers Monday through Saturday. OnTrac delivers Monday through Friday to selected Western States. We ship liquid yeast all year, but you need to order our optional insulated Liquid Yeast Warranty Box if you want to guarantee safe shipment during the warmer months. This is not covered by Free or Flat Rate Shipping and is an additional $6.90. We feature the latest cutoff time of any supplier. Orders placed by 4pm Pacific Time normally ship the same day.